Drill point Pressure 12mm steel plate: 741 lbs. Annular Cutter Capacity (Diameter): 2 Inch. Cutter Accepted: 3/4 inch Weldon. Length of Travel: 4-3/8 In. Twist Bit Capacity (Diameter): 1/2 inch. 10.0 Amp Motor With 2-Speed Settings Provides Optimal Performance In A Variety Of Applications. Overload Protection Electronics Prevent Motor Damage And Excess Accessory Wear, Quick Change Chuck System Allows For Tool Free Change Between 3/4" Weldon Shank And 1/2" Keyed Chuck. Magnetic Coolant Bottle Can Be Placed On Either Side Of Tool Or On A Work Surface To Allow For A Variety Of Tool Orientations. 4-3/8" Drill Travel Offers Maximum Capacity For Heavy Duty Applications. Motor Height Adjustment Gives Greater Range Of Accessory Compatibility. 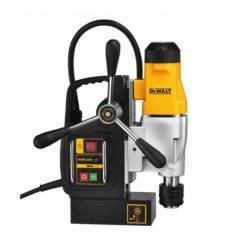 Dewalt 1200W DWE1622K 2 Inch 2 Speed Magnetic Drill Press is a premium quality Magnetic Drills from Dewalt. Moglix is a well-known ecommerce platform for qualitative range of Magnetic Drills. All Dewalt 1200W DWE1622K 2 Inch 2 Speed Magnetic Drill Press are manufactured by using quality assured material and advanced techniques, which make them up to the standard in this highly challenging field. The materials utilized to manufacture Dewalt 1200W DWE1622K 2 Inch 2 Speed Magnetic Drill Press, are sourced from the most reliable and official Magnetic Drills vendors, chosen after performing detailed market surveys. Thus, Dewalt products are widely acknowledged in the market for their high quality. We are dedicatedly involved in providing an excellent quality array of Dewalt Magnetic Drills.